IMG_3259, originally uploaded by Pink Lady on the Loose!. Especially when the weather is warm, my husband and I love to walk for hours on end. 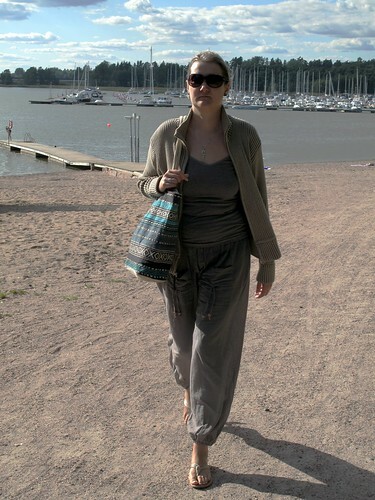 This photo was taken in August, 2011, when we were living in Kauklahti, Espoo, Finland. We lived quite near the sea, and that's something I'm really missing now. There's no ocean in the Czech Republic. You don't know how much something means to you until it's not there anymore. My pants, sandals, bag and sunglasses are all from India. The cardigan is from a thrift store and it's actually a men's cardigan.